ACCU-CHEK MACHINING INC. is a Secondary Machine Shop. Our 10000 sq. ft. facility is located at 37 Accu-Chek Drive in the Stackpole Complex, St Marys PA and has been in business since 1995. 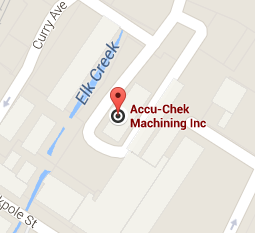 Our mission at Accu-Chek Machining is to service our customers with quality, price and on time delivery. We have an excellent quality and delivery record, which can be verified by our customer surveys. To keep abreast with Quality Standards, we have become ISO-9001 Certified. Our shop utilizes CNC Lathes and CNC Machining Centers. The Lathes have tailstock capabilities that are capable of Turning, Boring, Grooving, Threading and Facing, etc. We have Auto Loading Lathes to handle the high volume jobs. The Machining Centers have 18 x 12 inch of travel and are capable of Milling, Slotting, Drilling, Tapping, Re-Tapping, Boring, etc. Some Machining Centers have dual pallets that enable us to machine two (2) or more sides of a part with just one (1) set-up. This gives our Customers a better turn around time on their parts. Partials can be shipped without having to wait for the entire order to be completed. And our Linear Abrasive Grinder for one sided grinding for high production jobs. If you have a need for Secondary Machining, and would like us to submit a quote on your parts, we would appreciate the opportunity to quote. Fax (814) 834-7863,e-mail, or you can mail to the above address.